Animated “Torrey Pines” by Clyde Petersen kicks off TWIST on Oct. 13, at the Egyptian. Parties for cinephiles include TWIST: Seattle Queer Film Festival; South Asian Film Festival; Tacoma Film Festival; and binge-watching opportunities for fans of Polish, Italian and short films, too. The Big One (SIFF) is many months away, but during the next few weeks Seattle will be inundated with film festivals that cover a wide range of topics and styles. The biggest change is a new name for the two-decade-old Seattle Lesbian & Gay Film Festival, now being called TWIST: Seattle Queer Film Festival. • Tacoma Film Fest, Oct. 6-13: Most events are at the Grand Cinema, 606 S. Fawcett Ave. in Tacoma. Information: tacomafilmfestival.com. • Seattle Polish Film Festival, Oct. 12-23. Most screenings are at SIFF Cinema Uptown, 511 Queen Anne Ave. N., Seattle. Information: polishfilms.org. • Social Justice Film Festival, Oct. 14-25, socialjusticefilmfestival.org. • Seattle Shorts Film Festival, Nov. 11-14, seattleshort.org. 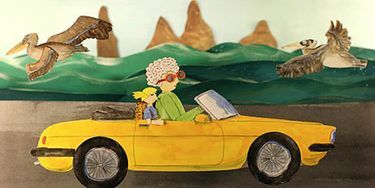 The world premiere of Northwest filmmaker Clyde Petersen’s animated charmer, “Torrey Pines,” kicks off TWIST at 7:30 p.m. Thursday, Oct. 13, at the Egyptian. A buoyant, carnival-colored, dialogue-free, stop-animation fantasy, it’s based on Petersen’s memories of growing up near Torrey Pines Beach and State Park overlooking the Pacific near San Diego. Petersen calls it a “transgender punk coming-of-age tale that takes place in Southern California in the early 1990s.” He cites MTV as an influence. The original score is by local musicians. A party follows at V2 Art Space. Another world premiere, “The Falls: Covenant of Grace,” is the third installment in a popular series about gay Mormons fighting the church’s restrictions. It’s not as focused as the earlier films, but if you’ve seen the others you’re probably hooked. Considerably lighter in tone is another sequel, “Bearcity 3,” which has its American premiere during the festival. Three “centerpiece features” call attention to films with parties: “Pushing Dead,” a fascinating character study with James Roday and Danny Glover; “Out Run,” about a transgender woman with political ambitions; and “Women Who Kill,” a comedy-thriller about commitment phobia. Three Dollar Bill Cinema Showcase, produced in the festival’s Reel Queer Youth summer workshop, is a free program. Other shorts in the festival focus on trans lives and chance encounters. TWIST’s closing-night event is “The Pass,” with the British star of HBO’s “Looking,” Russell Tovey, as a soccer pro who falls for a teammate. The script is full of twists. So is the talented Tovey, who re-creates the role he played on the London stage. 6:30 p.m. Sunday, Oct. 23, at Cinerama. A party follows at Belltown Community Center. The South Asian Film Festival, which arrives at 7 p.m. Friday, Oct. 14, at the Seattle Art Museum, is marking its 11th year in the Northwest. It promises 22 feature-length films, including the provocative opening-night thriller, “Aynabaji,” from Bangladesh. It will be followed by live music and a party at the nearby Triple Door. The director, Amitabh Reza Chowdhury, is scheduled to attend, and so is the leading actor, Chanchal Chowdhury. It’s about an actor who gets paid to go to jail for rich people. The festival, which calls itself “the largest, longest and most diverse South Asian film festival in the U.S.,” will be spread over several venues: the Seattle Asian Art Museum, the Stroum Jewish Community Center, the SIFF Film Center, the Carco Theatre and the University of Washington’s Thompson Hall.